This recipe comes from one of my favorite food blogs, Simply Recipes. My poor husband loves, loves, loves red beans and rice, but in our 20 years of marriage, I think I've only made it one other time. What you see pictured here, I didn't even taste. Have I mentioned I'm a bit of a weirdo? Beans are one of my foods I do NOT eat. It's the texture, along with the reputation they have for giving people gas. I have deep-seated issues about gas that I won't go into here, but suffice it to say, the beans I serve usually come from a can because I am not going to be eating them. Hmm. Sounds really self-centered when I say it like that. Everyone who DID eat these beans tonight said they loved them, so I think it must be a good recipe. It looked really meaty and yummy... if I liked beans. So there you go. That seems to be all I have to say about this recipe. After two hours of soaking, drain water from beans. Add the ham shank(s), garlic, onion, celery, bell pepper, water, and Worcestershire sauce. Bring to a boil. Reduce to a simmer and cover. Simmer for 1 1/2 to 2 hours, or until beans are tender. Remove ham shank from the pot to a dish. Let cool slightly and then shred the meat away from the bones. Return the meat to the pot, and add the seasoning and Worcestershire sauce (if you can remember it). Cover and simmer for another hour or until the mixture gets creamy and thick. Season to taste with Tabasco sauce. 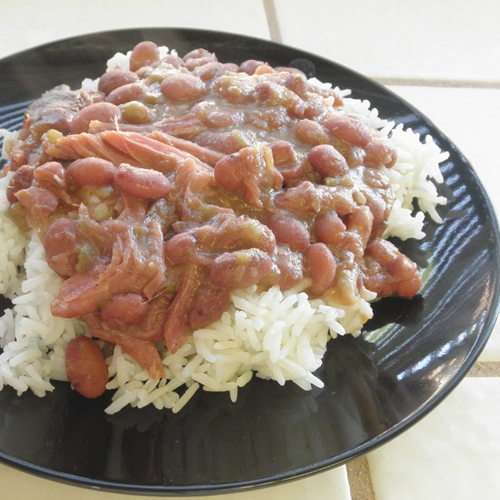 A hint for the red beans to soften the hulls and take out the gas, that people say they get from eating beans. After they come to a boil and you turn the fire down add a pinch of baking soda and stir like crazy because they are going to foam up. I'm pretty sure this is where the gas goes! It also serves for a creamier gravy. Being from Louisiana I've eaten tons of red beans and they alway come out good this way.